Features: Exquisite workmanship, stretch is a micro-bomb, soft touch, moderate wear resistance. 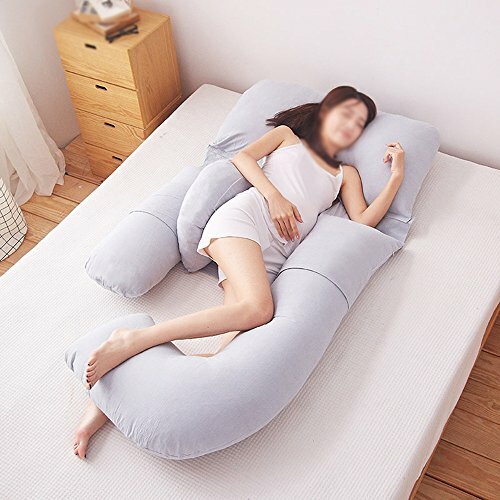 ➷ Pregnant women Pillows are shipped in a folded package and may have creases when you receive the product, which is normal. ➷ Washing method: Pillow can not be washed, not exposure; pillowcases can be washed, machine washable, low temperature ironing, not dry clean, not bleach. ➷ manual measurement, product size may be 5-8 cm error. ➷ As the spotlight is not the same, the screen color is different, it is normal. ➷ delivery time is generally 10-15 days, 30 days did not receive your purchase of the product, please contact us promptly. ➷➷ If you have any questions, please feel free to contact us. ➷ selection of high quality cotton fabric design, breathable moisture, comfortable and healthy, fit the abdomen, effective support. ➷ Internal filling of high quality materials, environmental protection, good elasticity, thick and full, comfortable and not easy to deform. ➷ neck care, waist, leggings, shoulder pads, sleep aid, a variety of functions to meet the various needs of your pregnancy. ➷ Humane longer design, suitable for pregnant mothers during each stage of pregnancy, mothers sleep more comfortable. ➷ products include only a pregnant woman pillow, does not include other products on the picture, specifically to receive the product based. If you have any questions about this product by Pregnant women pillow, contact us by completing and submitting the form below. If you are looking for a specif part number, please include it with your message. Calla Toddler Pillow Soft Organic Cotton of size 13" x 18" x 3.5"